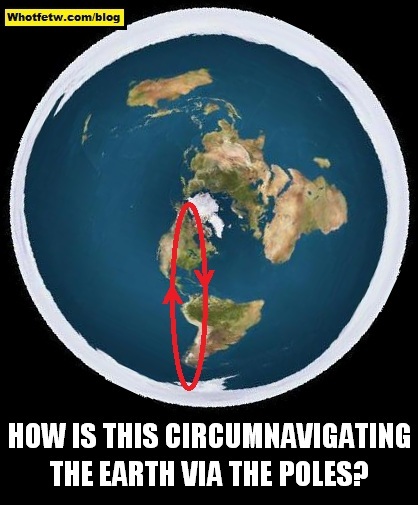 So one of the arguments, out of thousands and thousands of FE proofs is that no one has ever circumnavigated the Earth by plane, pole over pole. Now we see a story “allegedly” from a pilot who “allegedly shattered the 1987 record”. HA HA HA. If the Earth were a globe commercial flights would of been flying over the south pole regularly to get from South America to South Africa to Australia saving time and much money. Cables would have been laid for communication laid much easier over ice than into the deep sea bed floor, etc. This is in reaction to the Flat Earth movements growing numbers. this is what winning looks like. A pilot from Fredericksburg, Virginia, has flown around the world in a single-engine airplane on a route down the eastern side of the Americas, over the South Pole, across the Pacific Ocean, up the West Coast of the U.S. to Alaska, over the North Pole, and home. ← Just Another Co-Incidence Theory? Why Does Obama Keep Mentioning FE? What interests me are the ‘illusions’… what SEEM LIKE, then top ppl ‘buy’ it, everyone folliws…sheeple. I love these sites. Stars were clearly shown NOT to be burning suns. President Kennedy and Admiral Byrd knew that our world was not a round spinning ball. That is why they and many others have been tossed under the bus. One must remember the 80/20 rule, that 80% off the people are stupid and 20% are less stupid. All they need to do is fool the 80% of the population that is stupid, and mock and scoff at the 20% that is less stupid, and there occult magic will always work. It worked well with the Kennedy assassination, the fake Apollo Moon Landing, and 9/11. Television is there best weapon against the dumb masses. There is no hope for the dumb human masses, you can only save your self, forget trying to convince dumb humans what is really happening. You’re right no doubt about that, but we must help other fellow humans too. At least we who are awake now gotta try open their eyes. The number of people who are awake is significantly small compared to the number of those who are still believing the lies. So without the majority we can’t do nothing against these devils.